It feels like it has been forever since my last banana bread recipe. So when I had some lovely pink rhubarb and overly ripe bananas sitting on my counter top. I knew Healthy Sugar Free Rhubarb Banana Bread was in my future. Naturally sweet and packed full of goodness, who doesn’t love a loaf of good banana bread? Even better when it is bordering on the healthy side. Let’s talk a little about the flour’s I have used in this loaf. 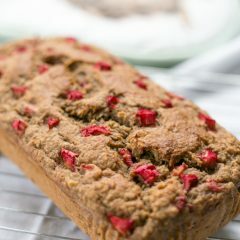 I decided to use a combination of plain/all-purpose flour and oat flour for this healthy sugar free rhubarb banana bread. We all know about plain/all-purpose flour, but has anyone used oat flour before? I have a few times and I like it. It has a far higher fibre content than regular flour. But it can leave bakes a little on the heavy side and that is why I used a combination of flours for this banana bread. Oat flour can be a little hard to come by at times and is surprisingly expensive. To get around this I just make my own, weigh/measure out the amount I need in oats then just blitz them into flour. I find a few minutes in a food processor, on high does the trick perfectly. Ta-dah homemade oat flour, which is packed full of fibre and many other healthy nutrients. And on a side note if you use certified gluten-free oats then this is great gluten-free flour. Though I must stress this is not a gluten-free recipe. Fruity…. with a touch of veg! As this is banana bread, it obviously has bananas in it! 3 whole ones to be precise. Ripe with brown spots all over them. 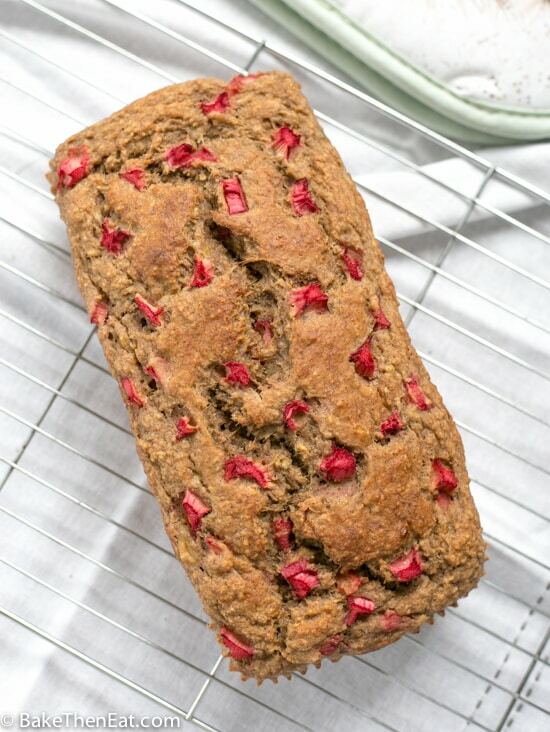 They really do need to be at this stage, because this healthy sugar free rhubarb banana bread has no sugar added to it, we need those bananas to be as sweet as possible. The rhubarb I used was also super sweet, lovely pink forced rhubarb. Which is in all the shops right now and technically is a vegetable! Making this even healthier. I have made this loaf a few times and I have always found it sweet enough for me. I enjoy a slice of this for my breakfast with no guilt but I don’t like an overly sweet breakfast. But if you do prefer something sweeter, then I would add just 2 tablespoons of sweetener to the batter. 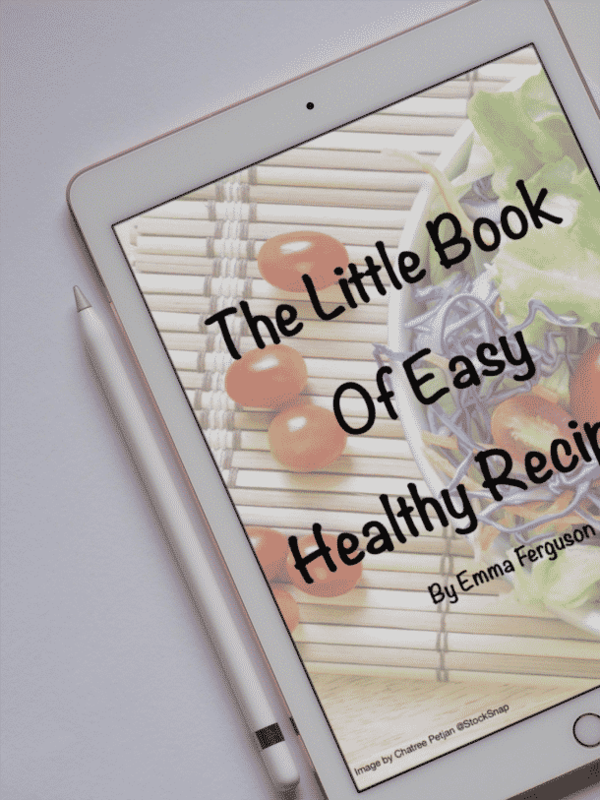 Something natural like Truvia, Nutvia or something Stevia based and this will then keep this recipe sugar free. So we have hearty fibre rich oat flour. A portion of fruit with the bananas and a portion of vegetables with our rhubarb. Zero sugar and to keep things light I used reduced fat olive spread in place of butter. Any spread/fat should work in this recipe – oil, coconut oil, butter, vegetable spread or even good old fashioned butter. As long as it can be melted or is in liquid form it should work. 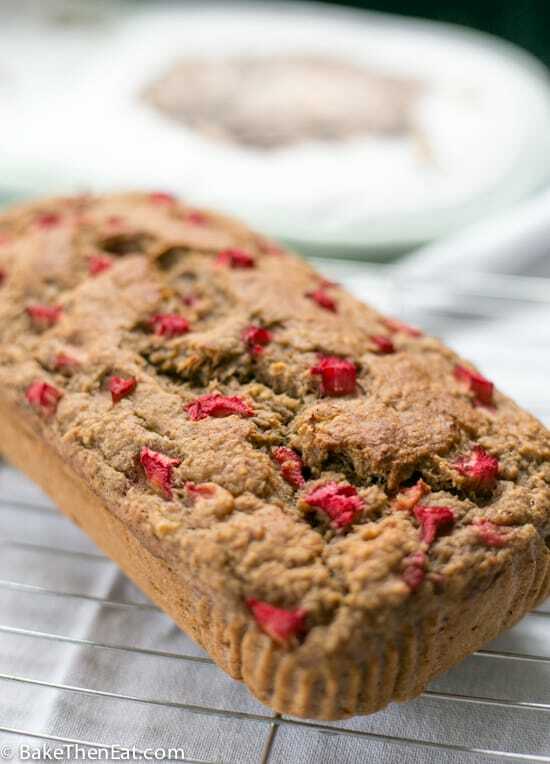 Healthy Sugar Free Rhubarb Banana Bread is easy to make loaf that is quick to come together and perfect for breakfast or an afternoon snack. Preheat your oven to 180C/350F/Gas mark 4 and either lightly grease or line a 2-pound loaf tin and place it to one side. In a medium-sized mixing bowl combine the flours, baking powder, cinnamon, salt and sweetener if you are using it. Mix everything together, then place to one side. In a medium sized jug/bowl add in the mashed banana, vanilla extract, egg, melted spread and the 3 tablespoons of milk and gently whisk until everything is well combined. Pour the liquid ingredients into the dry and with a gentle hand fold everything together. Fold in 80% of the rhubarb slices and pour the batter into your loaf tin. Sprinkle the remaining rhubarb slices over the top and place in your warm oven. Check on your loaf after 40 minutes if a skewer does not come out clean then give it a few more minutes. I have a slow oven and I found 45 minutes hit the sweet spot. Take the loaf out of the oven and leave it in the tin for 10 minutes before transferring it to a wire rack to fully cool down. Kept in an airtight tin this loaf is good for 5 days or it can be frozen for up to 2 months. As I mentioned in the post the easiest way to get oat flour is to make your own. Get good old fashioned oats weigh them out. Then blitz them on high in a food processor for a few minutes until fine, just like flour. Sweetener is not necessary and completely optional if you prefer a sweeter bread. 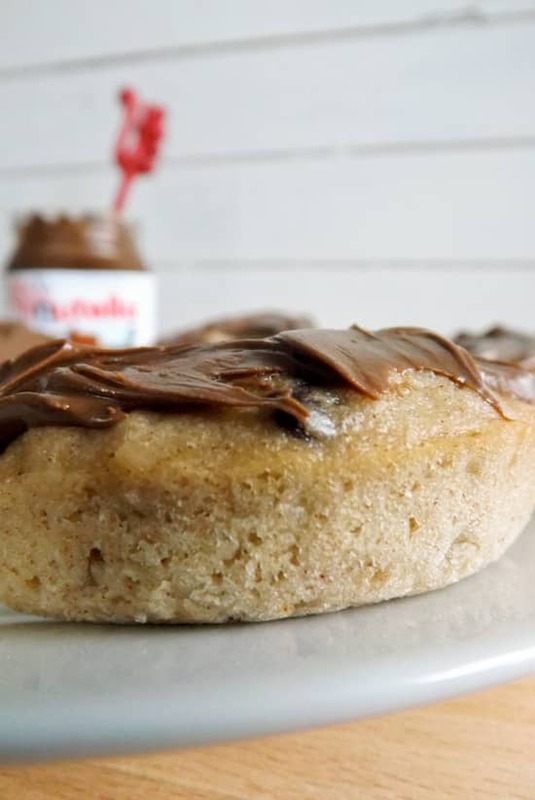 Try to stick to a stevia based sweetener to keep this bread sugar-free. I used reduced fat olive spread but any fat should work - butter, coconut oil, vegetable/sunflower/olive oil. Any kind of milk is suitable for this bread. I used unsweetened almond milk, but that is just my preference. Cows or any plant based milk will work. To make Vegan, use your favoured egg replacer for the egg in the recipe, stick to plant based fat and milk. How have I still NOT had rhubarb before in my life! LOL! OMG! GiGi you must try rhubarb, it’s a great veggie and it goes so well with so many sweet and savoury dishes. I love banana bread, and I’m all about the healthy sweet treats! This one looks delicious! Nice touch on adding the rhubarb! Thanks, Leanne. The rhubarb was a great addition, I loved its sweet-tart flavour with the banana. Lovely recipe. I recently started using homemade oat flour.. and yeah I have almost the ingredients available in the kitchen.I will try this for sure. I have a weak baking skills so wish me a luck too . You are right Albert, oat flour can make a cake very dense. Mixing in some all-purpose does help lighten it a little bit. 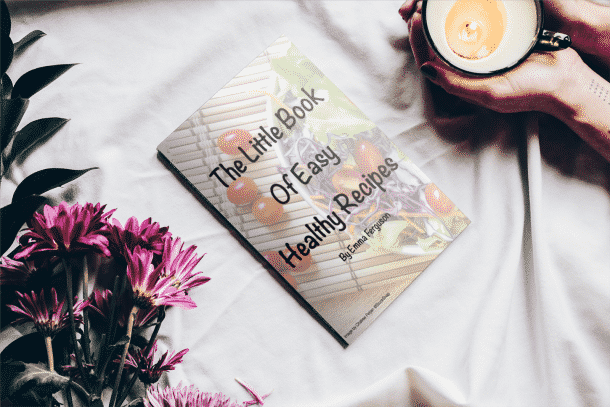 I was searching for desserts which opted natural sweetening instead of sugar and this recipe hits the top of the list! Banana bread without sugar is something I have never had before, but i am excited to try this out! thanks for this! Thank you, banana bread actually works pretty well without sugar as long as your bananas are lovely and ripe! Love rhubarb, and it’s coming into season here. Never had it in banana bread — terrific idea. Thanks! Thanks, Kelsie. I did pretty much eat the whole loaf by myself! This is such a good idea, when the rhubarb starts appearing I’ll definitely have to give this a try. Thanks, Caroline. I am sure you will love it. 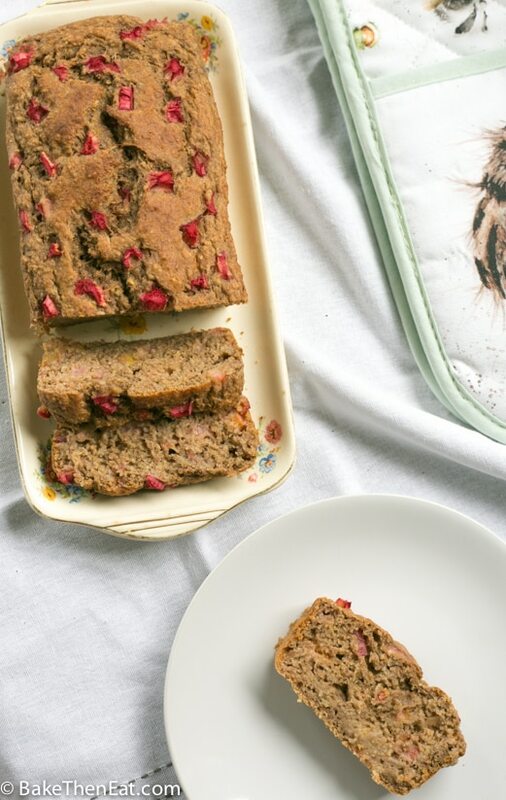 I love the idea of adding rhubarb to banana bread! My crop is usually paltry, so this is the perfect recipe to try! Plus I have to watch my carbs so a healthier version is perfect, too. Thank, Liz. 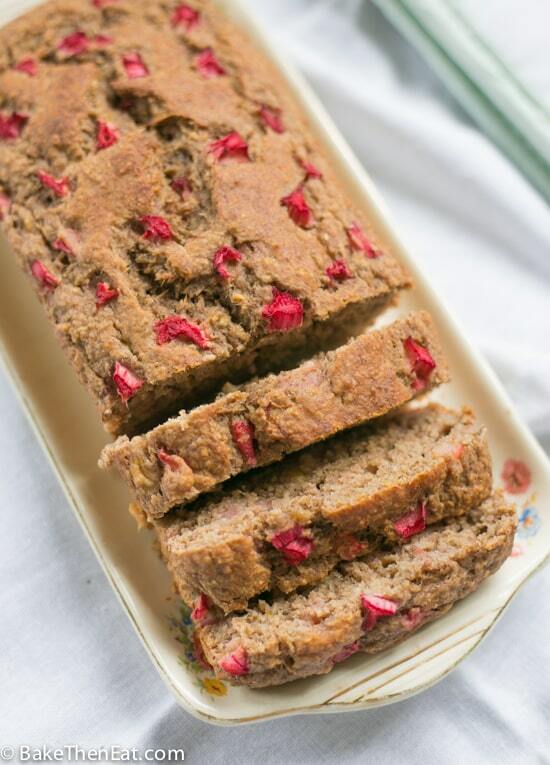 Rhubarb goes so well in banana bread, a really great combination. i’ve baked with rhubarb exactly zero times, but i know i’d love to eat this! very pretty, nutritious, and delicious! Combining the flours is always a good thing. Have you ever tried baking with Green banana Flour? We love it. Sure wish we had a rhubarb planted near us as can’t wait to try this recipe. Sharing, of course! I am yet to try green banana flour, but would love to give it a go if I can find some. I love rhubarb and grow it in the garden for a fresh supply every year. Who would’ve thought of pairing banana with rhubarb? (You, obviously!) Sounds like a wonderful combination! Perfect for elevenses! Thanks, David. I’ll pair almost anything with banana, just to try it out! A great idea adding this spring veggie to the banana bread! It looks wholesome!